Christmas at The Bookshop, Welwyn Garden City has stopped taxiing and is now soaring majestically through the winter sky. Customers' voices are noticeably more anxious; they fix us with their glittering eyes and 'There is a book....' quoth they. 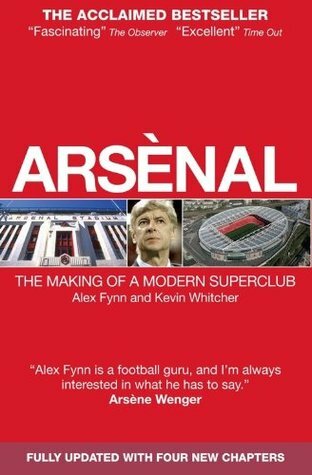 As if the exquisite pressure of finding, selling and ordering books and rebuilding the children's section every half hour were not enough, we are hosting an event next week with the sports writer Alex Fynn and the Arsenal footballer turned pundit, Alan Smith, who will be signing copies of the former's book: Arsènal the Making of a Modern Superclub. Note - the latter is not to be confused with Alan Smith, the Leeds footballer turned ex-Leeds footballer. Kurt Vonnegut once wrote (so it must be true) that 'No American is so old and poor and friendless that he cannot make a collection of some of the most exquisite little ironies in town' and, (transposing this sentiment across the Atlantic and diminishing it in scale somewhat) it seems my ironic lot (as a Tottenham Hotspur supporter) to be involved with Arsenal book signings. For those blog visitors less familiar with the tribal allegiances that pertain in the world of association football, I should point out that far from there being a feeling of chintzy neighbourliness between fans of the two North London clubs, they view each other with a kind of pathological, drooling bigotry that is beyond rational explanation, and almost never lend each other a cup of sugar. Some of us, however, are immune to this phenomenon, and are probably equally despised accordingly by many Spurs fans (no, it's alright - you're not getting confused, it's an affectionate diminutive for 'Tottenham Hotspur'). My last experience in this category involved a signing by another Arsenal footballer turned pundit, Ian Wright, over a lunchtime in a St Albans bookshop. We knew, of course, being booksellers finely attuned to the cultural and emotional landscape of our community, that Hertfordshire was a veritable nest of Arsenal (and Tottenham) fans, but the sheer size and emotional intensity of the crowd who turned up were astonishing. This was the only occasion on which I saw a queue for an event snake round the entire shop perimeter, go out of the door, round one side of the large shopping centre wherein we were located, and head down the hill a good way towards Harpenden, thus alarming citizens of that peaceable market town with fears of an invasion. The demeanour of the people attending betrayed awe and excitement in equal parts, and one couple even brought their baby, so that it could be photographed being cradled by Mr. Wright. At this point, I swore I saw two angelic figures hovering over the Arsenal footballer turned pundit's head, with footballs where their haloes should have been (they had a deft touch and showed a good awareness of where the goal was). Anyhow - if you're (a) local or (b) an Edinburgh-based Arsenal supporter with sufficient motivation, we'd be glad to see you next Tuesday, 18th December, from 12.30 - 1.30.